The E3 has started strongly, and has done so with a Microsoft that has shown that being an Xbox One user today is much better than it was yesterday . At the Redmond conference there have been games everywhere, but your real winning card is Xbox Game Pass . It is for a fundamental announcement: now those 10 euros that you pay per month will allow you to play the great exclusiveMicrosoft franchises from the first moment. This is coupled with the purchase of new development studios that will undoubtedly strengthen an offer that makes the Xbox Game Pass (for the time being) the envy of its competitors more than ever. And yes, we look at you, Sony. After these months Xbox Game Pass has been confirming its role as the Netflix of video games , at least in the case of the Xbox One that Microsoft continues to defend tooth and nail . The catalog of games was fantastic, but it is true that one could miss the access to the most current and innovative titles of the console. That changes to a great extent starting today , because the subscribers of Xbox Game Pass will be able to access among others titles that were not previously like ‘Fallout 4’, ‘The Division’ or ‘Elder Scrolls Online’, in addition to upcoming releases such as ‘ Forza Horizon 4 ‘, ‘ Sea of ​​Thieves ‘, ‘ Halo Infinite ‘, ‘ Gears 5 ‘ or news that will soon be added as ‘Warhammer: Vermintide 2’ or ‘Afterparty’ and future AAA titles like ‘ Crackdown 3 ‘ . Not only that: that trickle of exclusive games that will come to service will continue to grow, and now includes 199 games that belong to the catalog of the Xbox One, but also to various retro-compatible titles of the Xbox 360 and the original Xbox. At Microsoft they have promised that “at least” five new games will be added to the service at the beginning of each month . Those features that we enjoy paying 10 euros a month join the support of all the options of the conventional games of the Xbox One to retrocompatible old games: we can save games in the cloud, record clips of those games with Game DVR or streaming from those games to PCs and laptops with Windows 10. And if we unsubscribe from the service but want to continue enjoying those games, we can buy them with a 20% discount. Play all the new Xbox exclusive at 10 euros? Locuron! If you like to play all kinds of titles and you vary from game to game, it is clear that Xbox Game Pass is like a dream come true. Buying all the games available in the service would cost a small fortune: enjoying them for a year costs “only” 120 euros . All these games are played as if they were conventional games: downloads to the hard drive to play at any time, even offline and even without being subscribed to Xbox Live Gold , although in many of them that subscription certainly adds many integers to all those titles. The future, however, could be even more interesting: the arrival of FastStart will allow us to play as soon as possible the games that we download in Xbox Game Pass. This initiative makes use of machine learning techniques and will only be available in certain titles that will allow us to play them just moments after the download on our Xbox One disc has begun. Electronic Arts has launched a premium version of its subscription service. 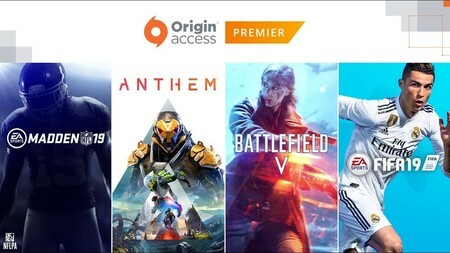 Origin Access Premier is the new modality that for an annual subscription of 99.99 euros (14.99 if paid per month) will allow us to play all the new EA games and access them one day before the official launch. Tremendous. The other innovation is equally promising, since Microsoft is confident that in the future they will be able to offer streaming games . That is the future of video games for some experts, and both Microsoft and EA – which has launched its Origin Access Premier to give it many more arguments – seem to position themselves for that future. In fact both companies claim to be working on the technology needed to offer that ability to play via streaming to their video game catalogs. Here Microsoft has an important advantage: its platform in the cloud, Azure, is positioned as a fundamental ally of that future in which we will no longer have to download the games on our Xbox One because, attention, we may not even have to play the games. Xbox One games on an Xbox One . How ironic.